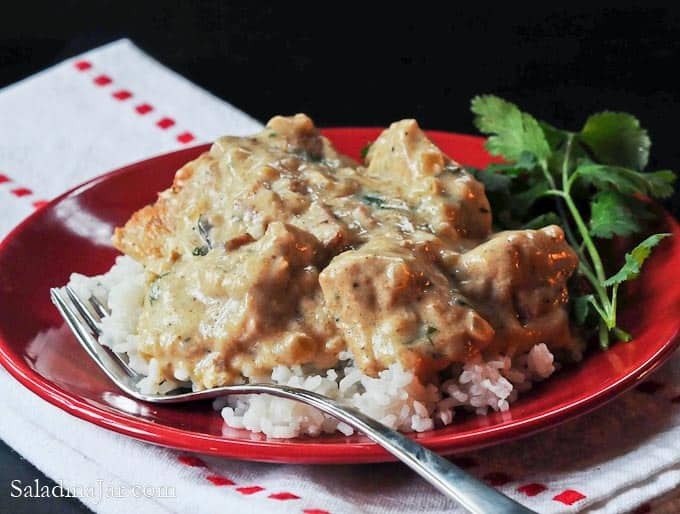 Sour Cream and Cumin Pork features sautéed pork strips in a sour cream gravy seasoned with cumin and cilantro. Serve over rice, noodles or even mashed cauliflower. Pork loin, Bacon, Cumin, Sour cream, Cilantro …a few of my favorite things. 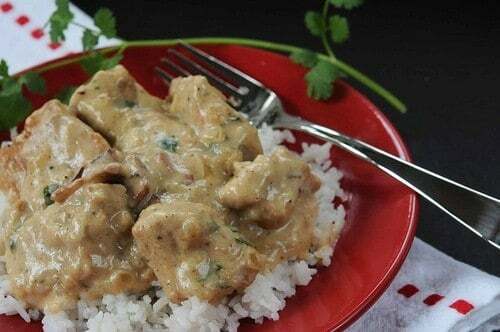 Put them together for a hearty Southwestern entree that reminds me of Beef Stroganoff–one of my all-time favorites. You’ll want to use lean pork for this dish. I like to use pork loin or what is sometimes to referred to as country-style ribs, the boneless variety. 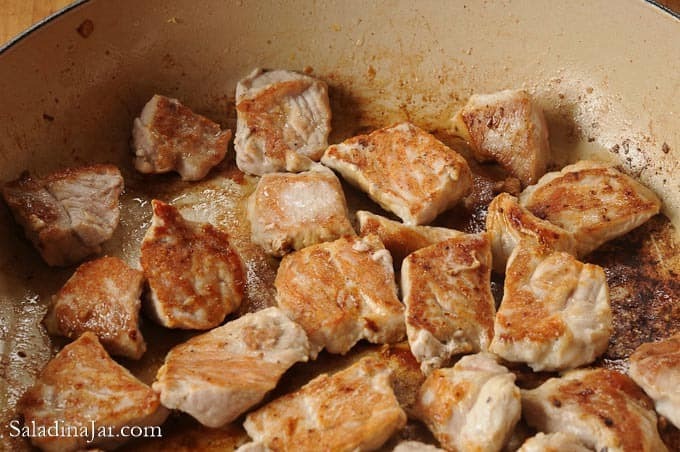 Be sure not to crowd the pork in the skillet. They’re actually a little bit too cozy in the picture above. 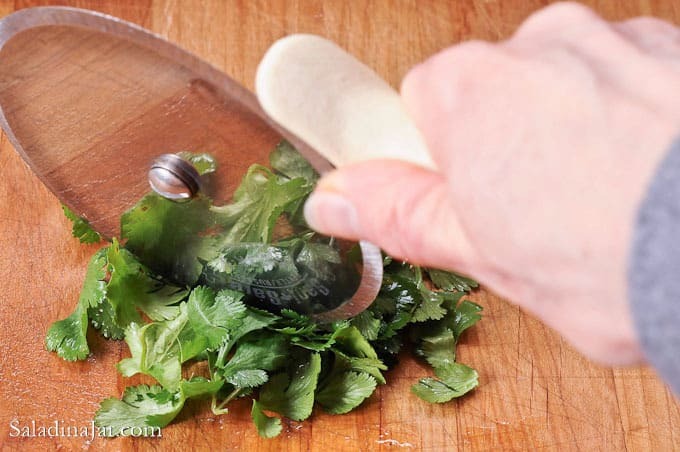 Try using a pizza wheel to chop fresh herbs. Works great, especially if the blade is still sharp. Leave out the fresh cilantro if you must, but it makes the dish, in my opinion. Have you noticed I pretty much say that about anything containing cilantro? Not everybody agrees with me. No problem! We can still be friends if you want to substitute parsley instead. Sauté bacon in large frying pan. Remove. Fry onions and garlic in bacon grease until soft. Add mushrooms and fry until slightly soft. Remove and reserve. 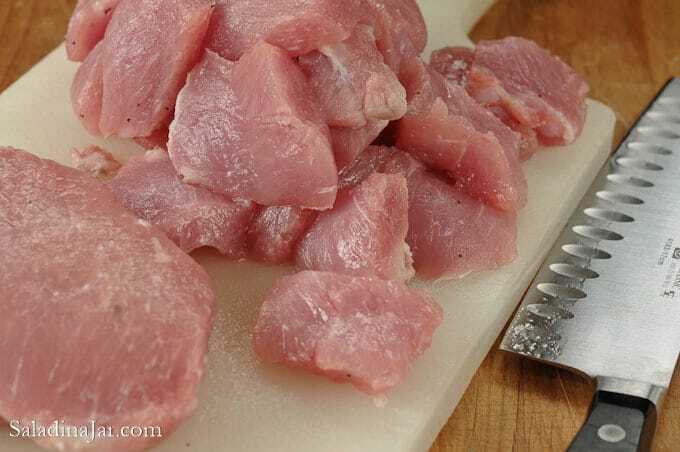 Cut pork into bite-sized pieces and brown over medium-high heat. Do this in two batches so the pan isn't overcrowded. After you put pieces in the pan, don't turn until well browned on first side. Turn and saute on the other side. You may need to add additional oil for second batch. Add bacon, onion, garlic, and mushrooms back to pork along with cumin, salt and pepper. Stir in chicken broth and lemon juice. Simmer for 30-45 minutes. 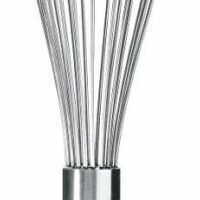 Whisk flour and water until smooth. Combine with pork and simmer until thickened. Remove from heat and add sour cream. Serve with chopped cilantro. Wonderful combination of flavors. The lemon was a great way to offset cumin that sometimes can seem a little heavy. Serendipity for me. I had pulled pork remaining and thought that something with cumin might be nice and luckily google gave me this site with this great recipe. I simmered my already cooked pulled pork in the broth for 20 minutes. I added left over grilled zucchini, cut, for the last part of the simmering instead of using with noodles or rice because my guys are off carbs. Great! I used up left over zucchini, left over cilantro, left over sour cream, left over pork and had everything else on hand. Quick meal in no time plus a cleaner fridge. This is going to be a regular at our house for using up the pulled pork. Can’t wait to try some of the other creative flavor combos I’ve seen on yor blog. We have this cookbook and have been making this recipe for years. It’s a MAJOR favorite, and my Husband, who doesn’t care for rice, likes his in tortillas instead. It’s a nice variation. I’m putting you on my ‘favorites list’ ! Wow! Yum! This looks super delish! This is something my family will love. I like the suggestion of rice or noodles. I will be printing the reipe today. Very elegant but easy. I can see this with sides of baby carrots, salad, rolls and your Microwavable custard pie. Yum. You’re awesome! This looks great! Will definitely have to try! !